The Chatsworth 1928 traditional triple exposed thermostatic shower valve pack with stylish ceramic control dial offers thermostatic showering via three easy-to-operate controls. Transform any bathroom's decor to the luxury and elegance of yesteryear. Designed to work with a two shower accessories, the classic style of this exposed shower valve adds a touch of sophistication and elegance in any bathroom. 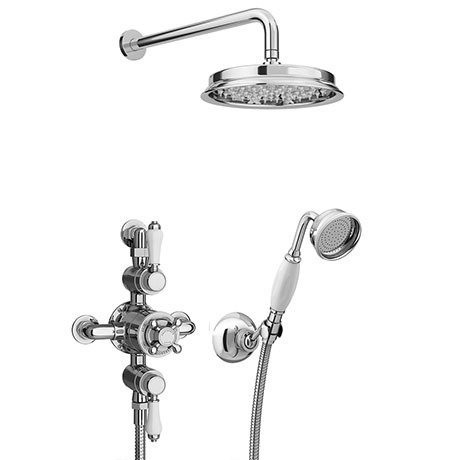 Pack comes with a classic chrome plated back to wall return shower elbow, a traditional chrome 8 inch fixed overhead shower head with arm and a large Victorian style shower handset with metal hook and hose.